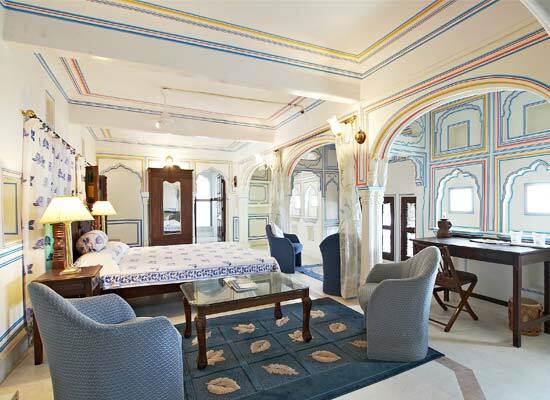 "Nimaj Palace, Jodhpur is one of the oldest heritage properties in Rajasthan. It gives you a chance to realize your dream of reliving the medieval era in a 22 all-suites accommodation. Right from the imposing gate, majestic facade to the plush interiors, everything will take you to a time travel of the chivalrous days. Country kin's sit-outs and the towering gates add a touch of royalty to the palace. A traditional welcome of the guests evokes a feeling of reverence and awe. A soothing welcome drink is truly a delight to the weary travelers. Spend some days at Nimaj Palace for an experience of a lifetime. 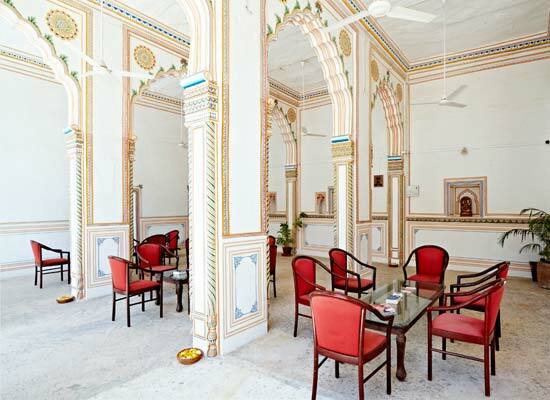 The branch of the Rathore clan of Rajputs who founded Jodhpur owns the magnificent Nimaj Palace. The Thakurs of Nimaj were one of the eight 'Sirayats' (highest honour given to feudal lords for their bravery and they formed the permanent advisory senate of privileged Thakurs) of the region of Marwar. 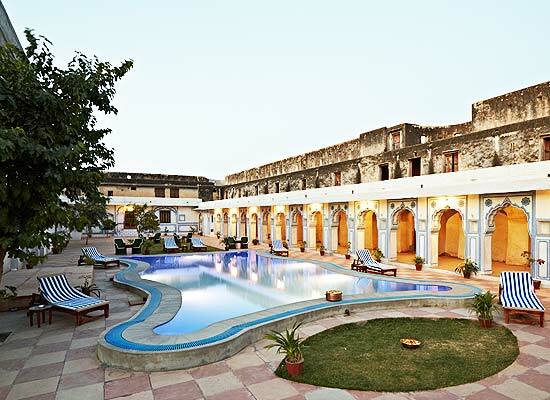 This heritage hotel in Rajasthan boasts of a 40 accommodation arrangement with attached baths with running hot and cold water. The suites are categorized as Suites and Royal Suites. The suites have all modern facilities and a treat to the eyes. 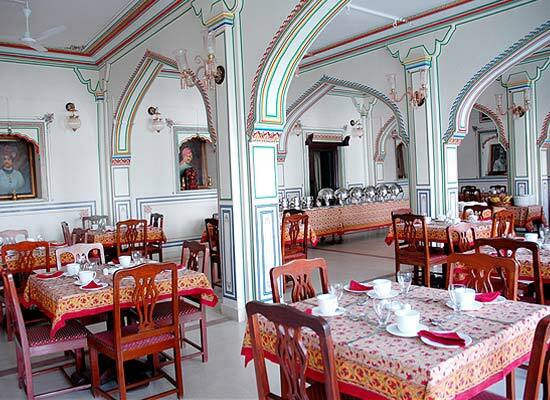 Formerly the venue of huge ceremonies hosted by the palace’s owners and then known as the Durbar Hall, Dari Khana today is a specialty restaurant that serves sumptuous delicacies of Marwar cuisines. A vast variety of delicacies, home-style cooking, freshest of aromatic spices and a wonderfully luxurious décor are the highlights. There is sit-out area also. With Sigdis (old-style warmers,) lining both the sides, Bara-Dari is an open air dining venue where meals can be relished on request. While enjoying your food, savor the lovely views of the surroundings. If you want, your dining experience here can be enhanced by food accompanied by Rajasthani dance and music. Spend the perfect evening here with your loved ones as the sun goes down or have a memorable barbecue dinner under the moon-lit sky. Offering a meal like the erstwhile rulers of Marwar, Bajot is a darbar-theme restaurant that serves food in typical Indian style. 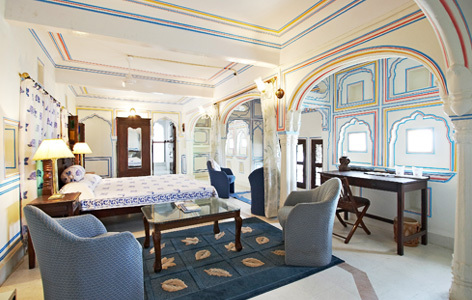 Savor sumptuous Rajasthani delicacies, while sitting on Gadra-Masand, comfortable mattresses, and cushions. The tables are low-lying and are called bajots. Food is served in a Thali by traditionally attired staff. Nimaj is a town in Jodhpur city of Rajasthan. Often referred to as the 'blue city', Jodhpur is one of the most sought after travel destinations in Rajasthan. There are many places to see in this colorful city, especially for heritage travelers. These places include Umaid Bhawan Palace, Osiyan Temple, Mehrangarh Fort, Jaswant Thada and more.